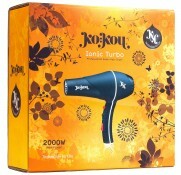 Ionic Turbo combines innovative design and production, resulting in high salon quality hair dryer. Ideal for every day use with 2000W long lasting AC motor and three temperature setting as well as extra long 2.5m cord. Contains a pik and a comb. Featuring one of our best selling products, with fast heat up to 210C with colour coded temperature indicator, ceramic floating plates technology and heating elements, this straightener can be used with adaptors worldwide thanks to Dual Voltage feature. 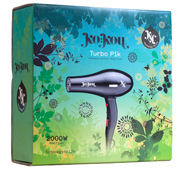 A salon professional hair dryer that certainly packs a punch with a whopping 2000W of power making it perfect for styling. With a sleek rubber coated contemporary design it’s the perfect addition to your arsenal of frizz-fighting hairstyling weaponry. 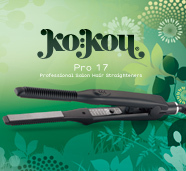 Designed with slim ceramic plates, this makes the Pro 17 ideal for straightening close to the roots, making it perfect for straightening short hair on men and women. 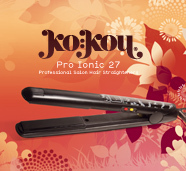 Fast heat up and advanced temperature control up to 210C and long cord for tangle free use. Register your product today to enjoy one year guarantee. By doing so, we'll add you to our special monthly draw to win Kokou limited edition prizes only to our competition winners. We would like you to enjoy the best service from our high quality hair appliances so we also added all manuals to Care & Maintenance section. You can download any manual now to keep your product in the best condition.